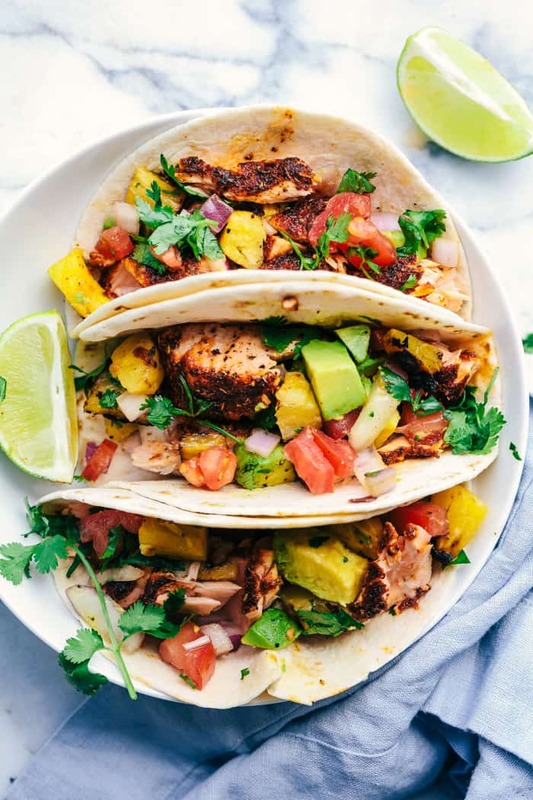 Grilled Spicy Blackened Salmon Tacos are grilled to perfection with a delicious spicy crust. They get topped with a fresh grilled pineapple avocado salsa. 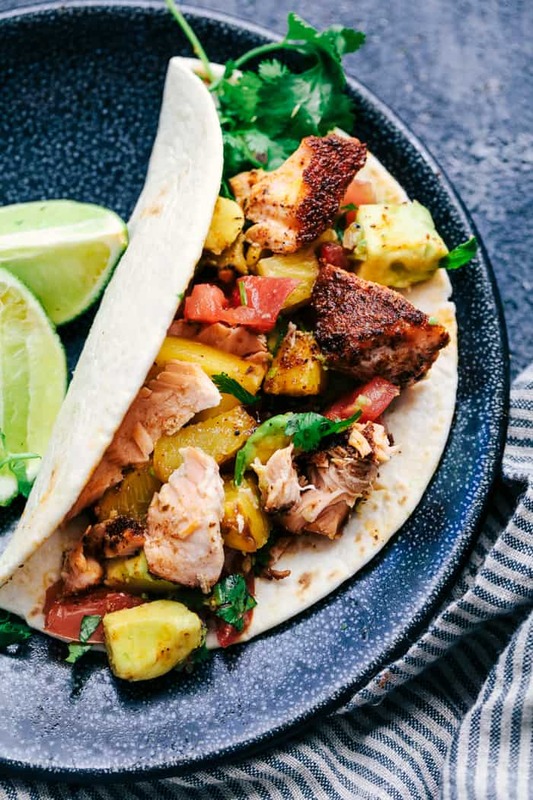 These tacos are fresh and light and the flavors are out of this world! This is a sponsored conversation written by me on behalf of Salmon Council. The opinions and text are all mine. Oh my goodness have I got a taco recipe for you today! You all know by now my love for salmon. Salmon is hands down my favorite fish. I eat it 2-3 times a week at my house and it has so many health benefits like omega 3 fatty acids and DHA and EPA which help to prevent against a stroke. I eat salmon so many different ways but grilled and stuffed into a taco might just be a new favorite. With the heat of summer in full swing at our house, grilling season is a must! We spend so many summer nights outside as a family and grilling is a favorite thing to do. My hubby always knows that salmon is apart of our summer grilling. Salmon is so easy to grill and ready in just minutes. Don’t be intimidated by it one bit! One of my favorite ways to grill salmon is on cedar planks. But you can grill salmon on aluminum foil, or even directly on a well oiled grill. I love the smoky flavor that it adds to the salmon and it grills to tender and flaky perfection. Let’s just talk about this spice rub. It is incredible on top of this salmon and forms such a flavorful spicy crust on top of the fillets. 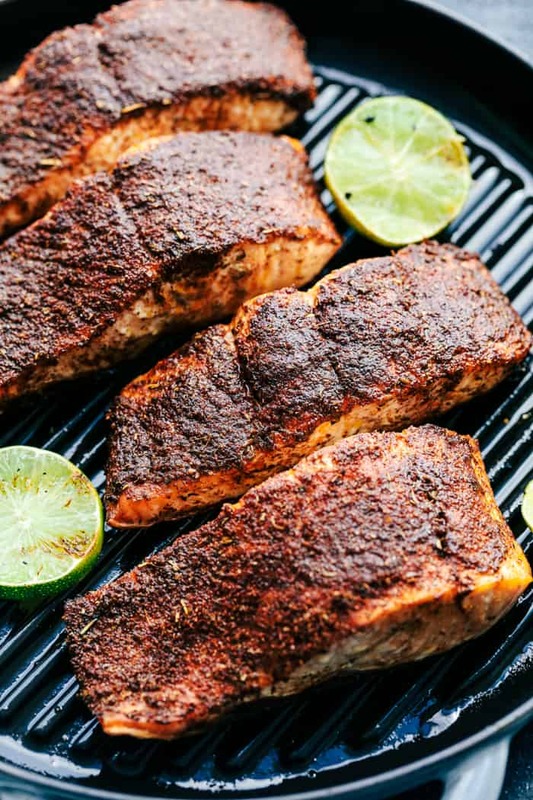 It has chili powder, paprika, cayenne, onion powder, just to name a few of the spices that help bring out big and bold flavor in this salmon. You are going to love it. 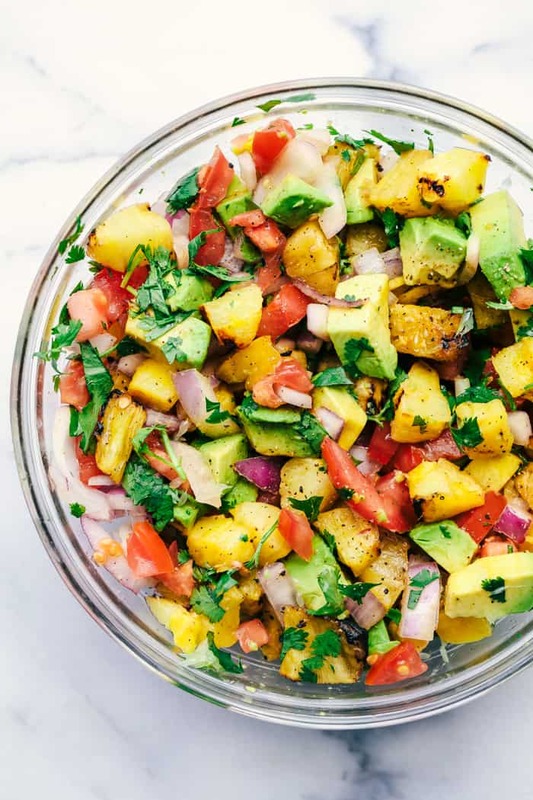 While the salmon is on the grill you make this incredible grilled pineapple salsa. I absolutely adore grilled pineapple and it is one of my favorite things to grill. It gives the pineapple a smoky flavor while keeping it sweet and juicy and only takes just a few minutes to grill. You add some freshly diced tomatoes, red onion, and avocado and you will have an amazing out of this world salsa to go on top of the tacos. 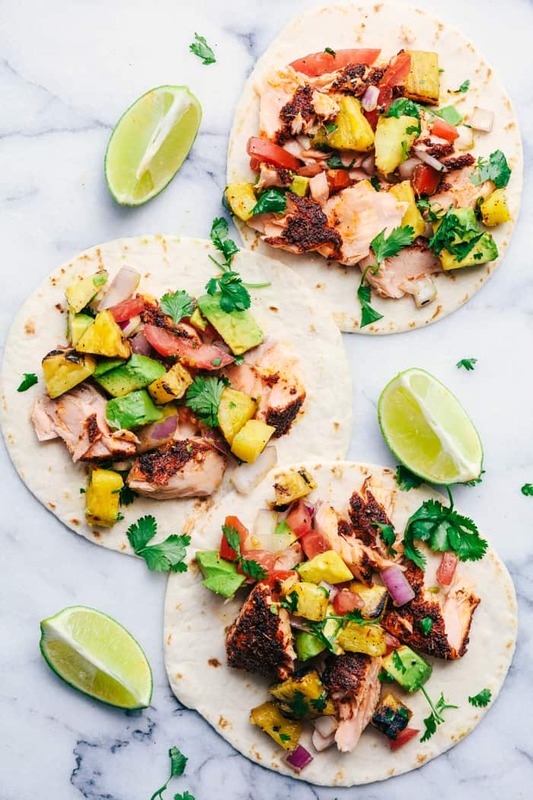 When it comes time to assemble the tacos, the salmon has been grilled to perfection and flakes perfectly. 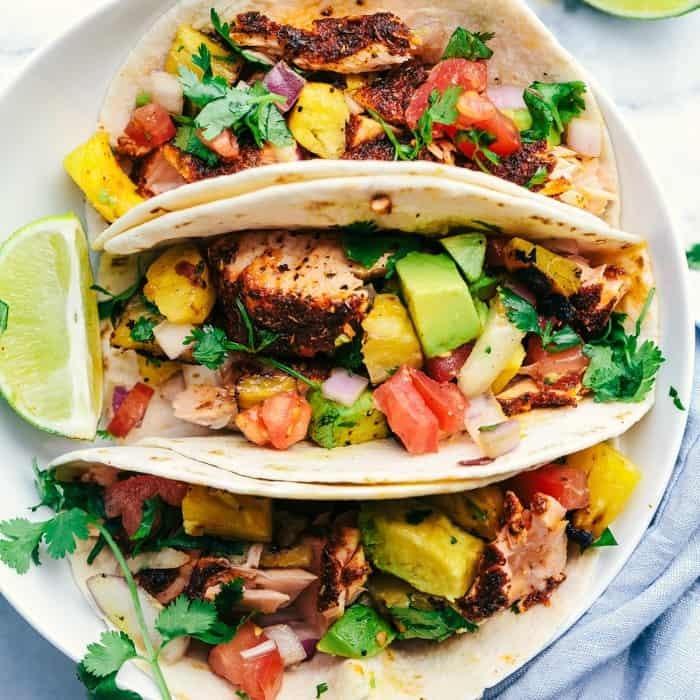 It is just the perfect thing inside of the tacos and the pineapple avocado salsa… OMG!! You are going to fall in love with these tacos with the very first bite. The flavors going on in these tacos will blow you away. You get the spicy flavor from the salmon and the cool and sweet flavors in the pineapple from the salsa. Oh man. These are incredible. I 100% know you are going to love these just as much as we did! If you are looking for a healthy and fresh grilling recipe, this one is just for you! It is a must to make for your next backyard BBQ and you are going to enjoy grilling salmon just as much as our family does. And if you love salmon just as much as I do, don’t forget to stay connected with Hooked on Salmon’s Facebook Page and Pinterest. You will want to keep up with all of the latest and greatest recipes that they have to offer! ? Preheat grill to medium high heat. Arrange the salmon on a cedar plank (or on aluminum foil) and drizzle with olive oil. In a small bowl combine chili powder, paprika, onion powder, garlic powder, salt, pepper, thyme, basil and oregano. Rub on the salmon fillets. Place the salmon on the grill and grill for 12-15 minutes or until salmon is cooked though out and edges are slightly brown. While the salmon is on the grill make the pineapple salsa. Place the pineapple spears on the grill for 1-2 minutes until they slightly char. Remove from the grill and chop and add to a medium sized bowl. Add the tomatoes, red onion, avocados, cilantro and lime juice. 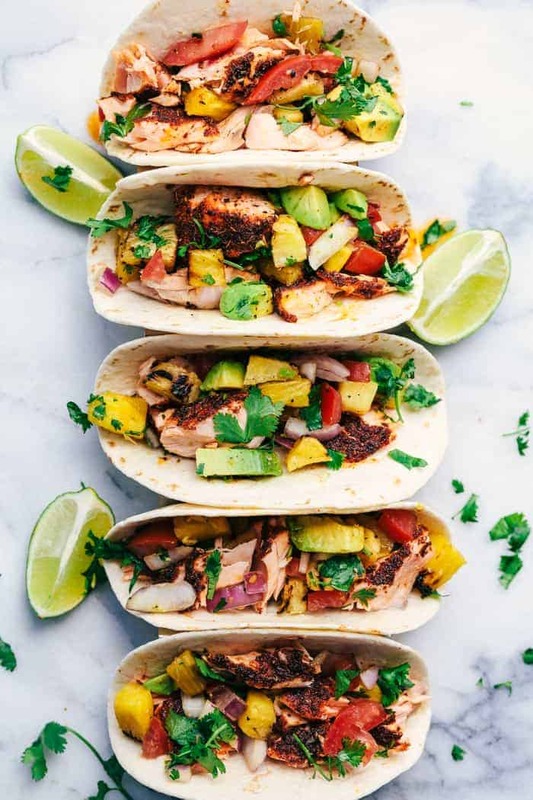 Assemble the tacos with a flour tortilla and flake the salmon into pieces. Top with pineapple salsa and serve immediately. This is a sponsored conversation written by me on behalf of Salmon Council. The opinions and text are all mine. I cannot wait to try this, breaking out the grill today!! Hubby is not a fan of salmon, but what’s not to love I am sure this can change his mind!!! Someday I am going to have to try some of your Salmon. I do kind of associate you with Salmon. It is a favorite of mine too. The rub sounds interesting. Thanks for sharing this recipe. I did go and follow Hooked on Salmon. I also scheduled this to our Facebook page. Awesome, i tried it and it was really mouth smashing taste. I can not even forget it. It is so good and so great. I will keep in touch with you for any new recipe. That spice rub! Drooling over how delicious these tacos look, Alyssa! Oh my Goodnee! I’m from the Deep South and came across you on my friend FB post. I’ve. I LOVE ALL you easy and quick recipes! Whey Lois sooo ready to eat and I can smell the aroma now in my kitchen. I know my grandchildren will come running! Thank you so much for your blog and everyone sharing. I can’t wait to get back with ya’ll guys with the results!